Every Wedensday morning while I’m doing my job I love to watch a cooking show called Chef Brad. It’s a local cooking show where Chef Brad focuses on making regular family favorite recipes with a healthy-whole grain twist. It’s kind of cheesy show, but I love the philosophy behind his cooking. He made a recipe last week I knew I had to try. It looked SO easy and I am all about eating more Italian food with a healthy twist. Let me tell you. 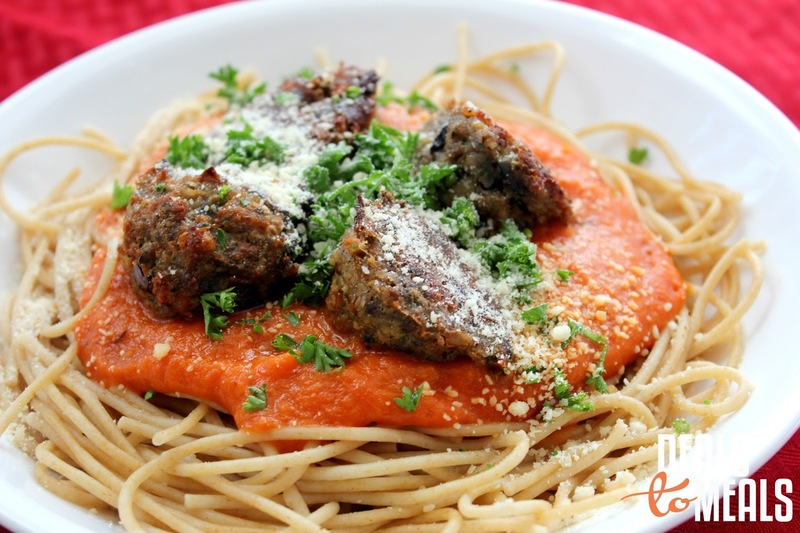 This blender marinara sauce is SO, incredibly good–and SUPER easy! I was in shock at how simple it was. It is going to be my go-to method when I need a quick, fresh spaghetti sauce. I loved the flavor of the roasted tomatoes and garlic and the fact I just bake it and then blend it. Such a novel idea! Then…you add these healthy turkey meatballs that have cooked brown rice in them (yum!) and you have a combination over whole wheat pasta that you can feel good about feeding your family. With a few simple, healthy twists, Chef Brad did an awesome job turning a family favorite recipe into something a little more nutrient filled. This was a HUGE hit at our house and I can’t wait for you to try it to. BONUS: ALL of the ingredients you need for this recipe are all on sale this week! Here’s a breakdown to see how you can make this recipe for under $10 for a family of 7-8 people. 16 oz. American Beauty $0.49 –crazy good deal, so STOCK UP!! Rinse the tomatoes. Remove the core of the tomato. Cut the tomatoes in half lengthwise. Cut the red onion into large pieces. Place the tomatoes and red onions in a large bowl. Add the whole garlic cloves, olive oil, salt, pepper, Italian seasoning and sugar. Toss to coat all of the ingredients with the olive oil. Place the ingredients on a cookie sheet with the tomatoes face down. Place them in an oven that has been preheated to 450 degrees. Bake the tomatoes until they are golden brown and slightly charred on top (not black, but dark brown is okay). Once the tomatoes are soft and tender, and the onions and garlic are cooked, remove the tomatoes from the oven. Let them cool for a few minutes and then pour the entire pan of ingredients into a blender (be careful, they will be hot). If you are using a smaller blender, just blend half at a time. Blend the mixture carefully with the lid securely fit to the jar. Blend until the sauce is completely smooth. Season sauce with more salt, sugar or pepper as needed. Serve the sauce over noodles with parmesan cheese. Meatballs make a nice addition too. In a mixer or a large bowl, add the ground turkey or beef. Use leftover cooked brown rice or oats and add that to the meat mixture. Dice the red onion very fine and add to the meat. Add the remaining ingredients to the meat and mix until everything is all combined together. Roll the meatballs into golf ball sized balls and place on a cookie sheet that has been sprayed heavily with non-stick cooking spray. Preheat the oven to 400 degrees and cook for 20-30 minutes, or until the tops of the meatballs are dark golden brown and crisp. If you are using turkey, the under side of the meatballs won't get browned unless you flip them over half way through the cooking process. While the meatballs are cooking cook the roasted tomato sauce and the noodles. Serve the sauce over the cooked noodles and garnish with fresh parmesan cheese and fresh basil.